Toop&Toop Blog: Love. Marriage. Homeowners. Gen Y are mixing it up! Love. Marriage. Homeowners. 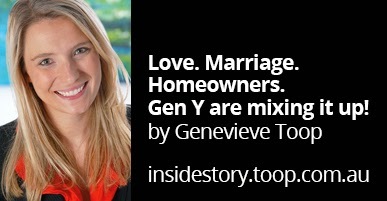 Gen Y are mixing it up! Three weeks ago, a very big event happened in my life. Tom, my best friend of 7 years got down on one knee and proposed to me. I couldn’t think of a better way to spend my 28th Birthday! Since that day I have been thrown head first into the world of weddings! What has stood out to me in these last few weeks after speaking with my Nanna, Mum, family and friends, is that the things you now have to think about are very different than they have been for previous generations. I listen to stories from Mum and Dad - they married at 22, and only then moved in and bought a house together. For their generation, it was still considered taboo to live together, and in some ways this made things a lot simpler. There’s no doubt about it, Gen Y’s are taking a lot longer to settle down. The median age of marriage in Australia sits at 29 for females and 31 for men. We are a generation of independent people, and by the time we are thinking about getting married, we may own a number of assets individually. This is where things can get complicated, but can also be an awesome opportunity. For those who own property and have partners living with them for more than a few years, it’s is a matter of being aware of the way the law sees this and how, regardless if you are married or not, it affects the equity in your home. It’s often something that is hard for Gen Y’s to talk about and for our generation this is the part that is taboo. But with people not settling down until their 30’s, and with many people moving in and living with their partner before marriage, it is just a matter of being aware of the risks and making sure you are protecting what you have built up over the years. In our line of business, this is a trend we are seeing too often, and it can get complicated. We are seeing people having to sell their property when their relationship ends, because they were either unaware of these implications, or naively, chose to ignore them. There is also a very exciting upside! While there may be risks to be aware of, this independence and asset building throughout your 20’s is an awesome opportunity! The fact that you can combine your resources together with your partner provides a fantastic start to married life. A couple I know really well are in this very boat. Throughout their 20’s they purchased their first homes individually, and they are now at a point where they’re working out how they move in together and best leverage these assets. Do they sell both properties and pool their resources to buy a larger home? Or, do they keep these properties and start an investment portfolio using the equity in the properties to buy a home together? What I’ve explained to my friends, after looking at their properties, is that with the market running hot, and the first home owners grant running out for established homes by June 30, it is actually a great time to look at the option of selling one or both of their places. Both properties are currently classified as principal places of residence, so there are tax implications with the way they are funded, and capital gains that become a part of the decision mix. However, with these types of properties in high demand from first home buyers, right now is a great time to put them on the market. First home buyers are keen to purchase before the end of this financial year to take advantage of the grant. Demand has been very high. While this might be the best thing for my friends, everyone’s circumstances, tax situations and properties are different. If you are at the stage of assessing your properties and would like some more information on how to leverage these, find out what the current market is doing and get some good advice, we can help. Your accountant and solicitor can help you with the tax and asset protection and we can help you on the investment strategy and sale or rental side. So, while Gen Y may be breaking the traditional moulds and mixing it up, fantastic opportunities are coming from this. It is so exciting to see the opportunities that come from starting your property portfolio early, and we love being able help people make the most of this amazing stage in their lives! So, even though it may be hard, have the taboo conversations about the financial subjects, sort out a plan, and go for it together.